Psychosocial Assessment documents are a collection of extremely personal matters related to an individual. The information gathered should not only be relevant to the case but also shouldn’t be disclosed to unauthorized persons to protect the privacy of the concerned individual. Sample Forms are detailed and mandatory to be filled accurately, as it assists the medical team to assess and plan treatment. The caregivers should be sensitized to the emotional condition of the patients. 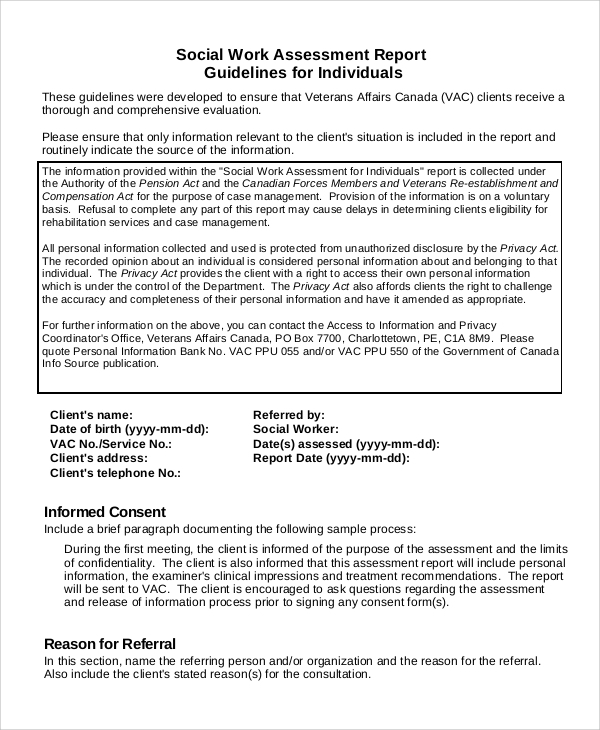 This document is developed as a guideline for veterans and has an evaluation process listed out. It covers various aspects of the individual like psychological, financial, characteristics, military history, family perspective, etc. 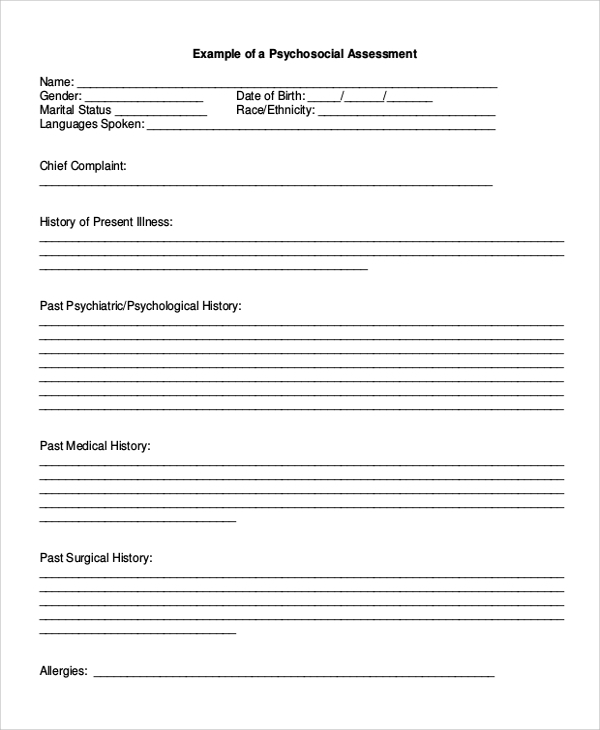 This form is a detailed document concerning an individual’s psychoanalysis, medical history, drug and alcohol related issues, risk factors, behavioral pattern as well as recommended medical treatment. 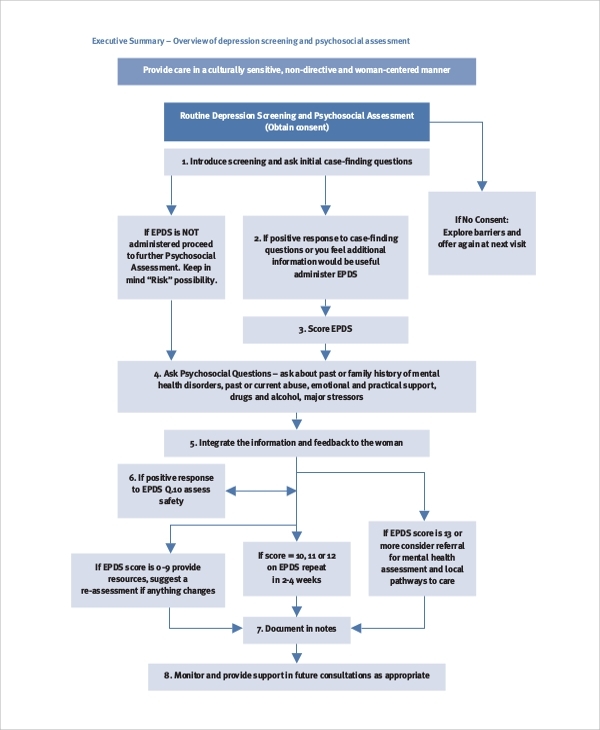 This document is designed specifically for mothers after delivery. A method to assess of any psychosocial concerns for the woman, her family, emotional imbalance if any, as well as existence of drug abuse or domestic violence. 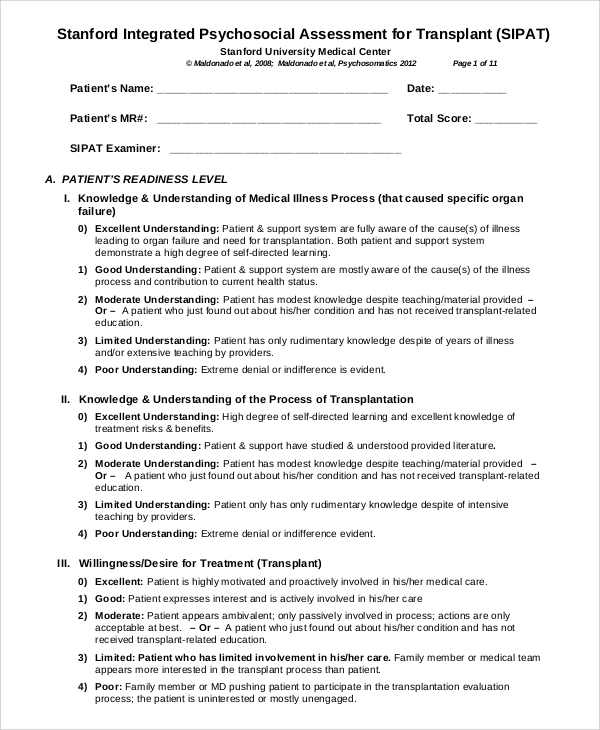 Psychosocial Assessment Forms are extremely vital to draw conclusions about the present condition of a patient. It does a thorough analysis of the medical history, and probes concerns regarding various forms of abuse and violence. Different assessment schedules have been drafted to include veterans, women, and children. All the information gathered is personal and sensitive for any individual. Disclosures to unauthorized persons will be an infringement of the privacy act. Proper care should be taken to use these forms discreetly and securely. Here the focus is the analysis of a distressed child, delving and investigating causes and studying factors like abuse, assault, domestic violence, etc. Victims of human trafficking are prone to such issues, and that aspect is taken into consideration too. This is a detailed document highlighting all factors related to psychological issues faced by an individual. From present illness to medical and family history, present medication and various assessments covering drugs, alcohol, suicidal tendencies, etc. 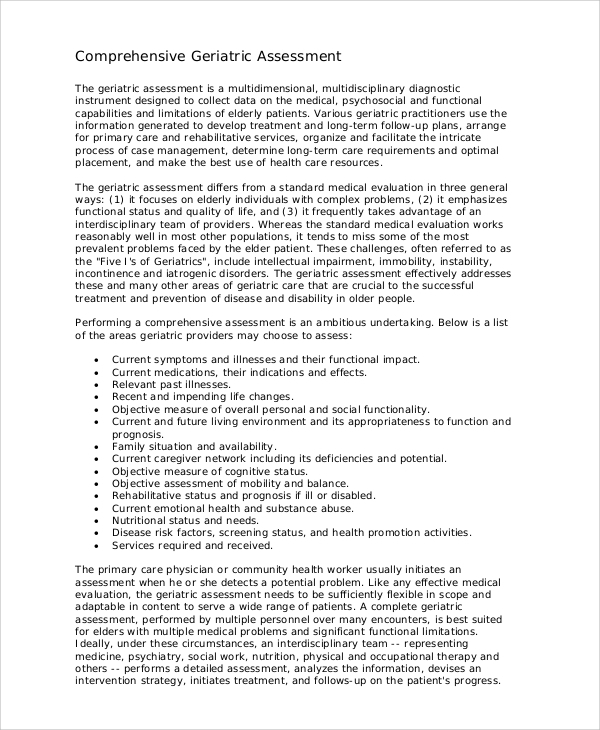 You may also see the Biopsychosocial Assessment Samples. 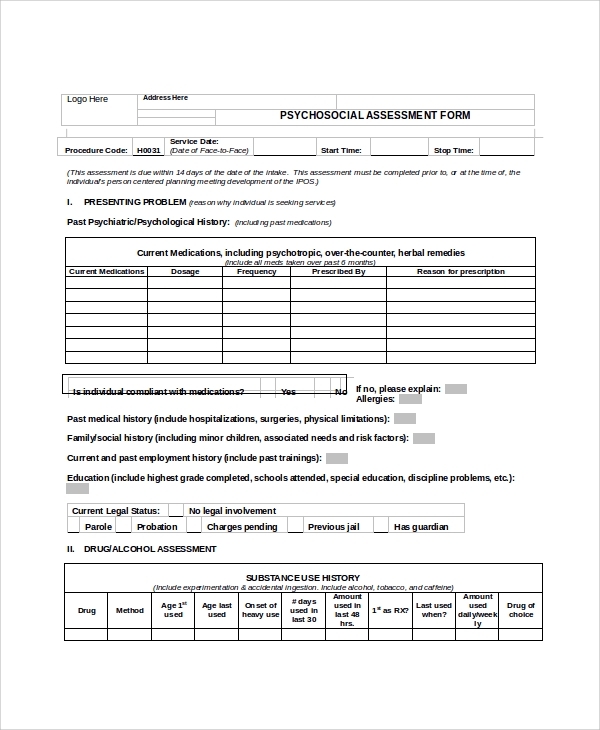 What are the uses of these Psychological Assessments Samples? The value of such assessments is paramount and assists the caregiver in analyzing the patient accurately and drawing plans on the course of treatment to be followed. The conclusions drawn should be free of bias and pre-conceived notions. Veterans, individuals, women and children are a few examples of who can use. At the discretion of the medical team, the circle can be widened to cover more categories of patients. 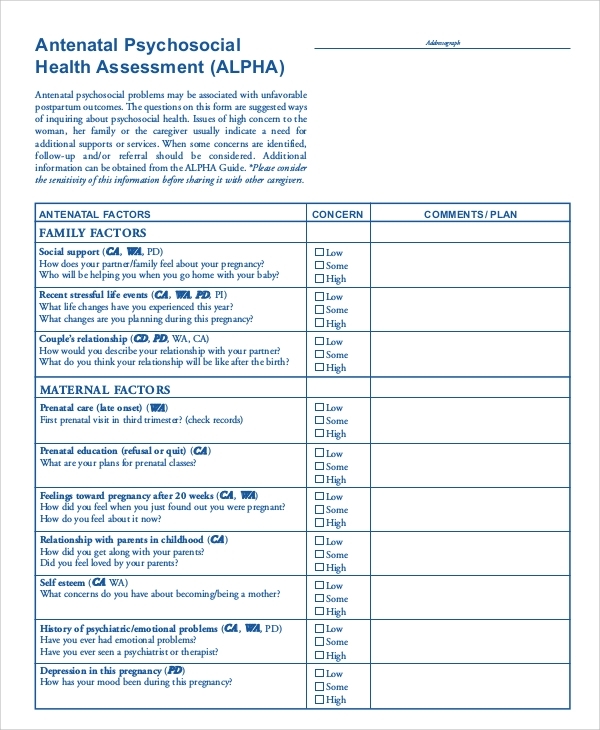 You may also see Sample Self-Assessment Forms. 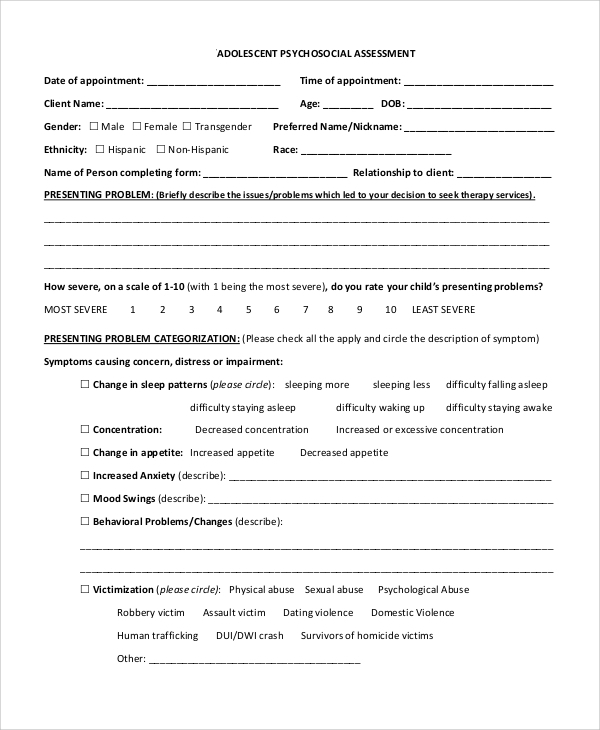 When an individual or a parent discovers that the person is undergoing some form of distress due to extenuating circumstances, these assessment forms will help to mitigate the concerns to a large extent. Psychosocial Assessments is an important approach for individuals who have been inflicted with such an issue. Quick remedial action will prevent the situation from worsening and on most occasions ensure the patient is on the road to recovery.The assessment should be derived after formally seeing the patient, examining him and verifying all documents in his possession.